Oops – Murdered the Wrong Baby! An Australian hospital has launched an inquiry after staff treating a woman carrying twin boys accidentally terminated the wrong foetus. Doctors had told the woman that one of her babies had a congenital heart defect that would require numerous operations, if he survived. The woman chose to abort the 32-week foetus but staff injected the wrong twin. The hospital in Melbourne described it as a “terrible tragedy”. “The Royal Women’s Hospital can confirm a distressing clinical accident occurred on Tuesday,” it said in a statement. The woman went on to have an emergency caesarean to end the life of the sick foetus. 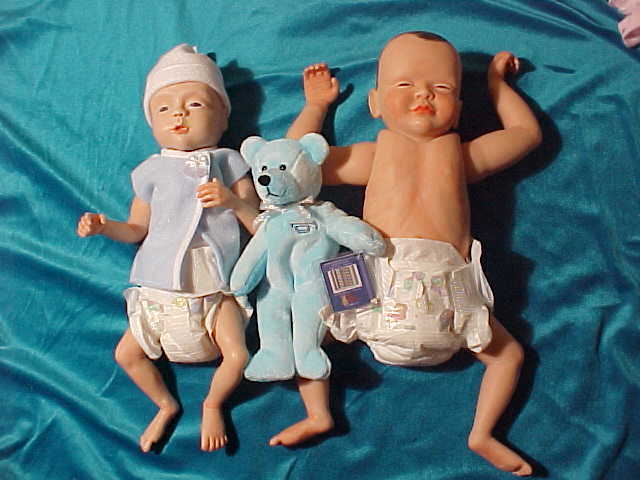 Doll replicas of a 26 and 32 week old baby born premature. HT: Picture from God’s Little Ones. Waking up on Thanksgiving morning here in America, we had a lot to be thankful for in our home. Preparing to spend some time with my wife’s folks, we finished some last minute items before leaving out the door. One of the last minute items was a quick check of the news. It produced a shock for which I was not prepared. The above quote from the BBC News says everything about the state of this world that we need to know. It is totally depraved and wants nothing to do with the truth, which means it wants nothing to do with God for God IS truth. As I read the article, my mind shifted from shock to anger at the callousness of individuals, of doctors, and of the healthcare industry in general. This is NOT to say that there are no believers who maintain the highest levels of integrity for there are many. There are also many who maintain that integrity because they are a new creation in Christ Jesus. The old things have passed away (namely, the thinking that murder of an unborn baby is acceptable) and all things have become new (namely, that we are fearfully and wonderfully made, and that a baby is a baby from the moment of conception). The amazing part is that the world does not, cannot, and deliberately chooses not to acknowledge the incongruity of the news article above. First, at 32 weeks, many babies have been born and gone on to live normal lives. Second, we need to understand that just because a doctor chooses to rip a baby out of its life support system does not mean it is not viable and therefore should be categorized as just fetal tissue. Third, the parents are told the baby would require many operations – if he survived. There was no guarantee the baby would survive, but there was no certainty the baby would die either! There are many who have had heart defects and also gone on to live regular lives. So, the solution – abort MURDER the little baby who is just weeks away from birth. The woman is in the 5th week of her third trimester! A God-given heritage and gift growing inside the comfort and safety of a God-given womb then finds itself being injected with a medical solution in order to end its life! The hospital promises that they are going to launch a full inquiry into how the WRONG baby could be aborted MURDERED! The mother went on to have an emergency C-section in order for the CORRECT baby to be aborted MURDERED! How utterly heart-breaking! This entry was posted in Abortion, News and tagged Abortion, Australia, baby tragedy, fearfully and wonderfully made, God-given heritage, heart defects, murder, premature baby, Psalm 94, triumph of the wicked, Vengeance belongs to God. Bookmark the permalink. Several years ago, a New York City newspaper covered the self-absorbed tale of a single woman who wanted to be a mother. She was “fertilized” and ended up carrying twins. She was horrified at the thought of becoming a Wal-Mart mom and decided to kill one of her babies for convenience. A colleague of mine – a cradle Roman Catholic – refused to believe that people actually abort babies for such reasons and claimed the newspaper report was a fraud – even though the story was widely reported. I am repeatedly reminded of the Germans in 1930s Germany. When will we wake up? I think there is so much symbolism in this story. There are two ‘beings’ wrapped up in the one ‘womb’. The LORD tells us in Galatians 4 to let the slave woman and her son go–our flesh. We have two parts; our flesh/our spirit. Our flesh will not inherit the kingdom of GOD. In some ways this seems symbolic of what will happen to all who are not surrendered to JESUS; both will be destroyed because the ones who are reasoning with their minds and with the ‘doctors’ (theologians) of this world, dont have truth. We are not to fear them that kill the flesh, but HIM who can throw both body and soul into hell. I can’t think of a more violent way to give birth (and in this womans case have her child killed) than a c-section. A truly sad story. I pray the LORD’s grace and mercy on her as she deals with the after shock of having not one but two children murdered. What is pathetic about our times is instead of facing challenges head on and seeing the LORD’s grace enable people to do the impossible, we choose to ‘rescue’ ourselves and free ourselves from hardship, only to destroy ourselves in the end. Deirdre, thanks for your comments. Yes, God does choose to spare some with congenital defects. Each brings honor and glory to God when we realize that He is sovereignly in control of all things. Some do not have the pleasure of being held for long. My youngest sister’s second baby had congenital problems that caused all of her little organs to be formed outside of her chest cavity. Doctors recommended abortion, but they said NO WAY! My brother-in-law was blessed to hold the baby for 22 minutes before the little one went to be with the One Who created her. My sister went full-term even though she was told the baby would not live, would be still-born, would never survive the birth, would be a danger to her own life, etc. The death of that little baby brought a sense of love and unity to a body of believers that was greatly needed. I know I probably shouldn’t be speechless but I am. I simply do not understand the mindset that chooses to murder particular children. It all sounds like some bad Sci Fi fictional story… except I know it’s not. Sad, so very sad. Praying for this mom when she wakes up and realizes how she was decieved into allowing her two precious babies to be murdered. I had to read the end of the article 2x to make sure that I was understanding that the second baby was also aborted. I keep hearing stories, first hand, of situations where the attending physician says “abort, abort, there are serious issues with the fetus” and then the child is born perfectly healthy. How tragic that life is so quickly disposed of. Heartless,brute beasts that no longer possess the natural compassion of humans.This is what happens when men reject God and are governed by their own intellect. Man is frightening beyond belief when he is separated from God Almighty isn’t he? How long before the aged are systematically “removed” from society? Ron, sadly this is already happening in other parts of the world including Europe. Belgium even allows for a doctor to murder a child under the age of one if they have certain debilitating factors. Europe will soon be where Germany was before World War II. Even so, come quickly, Lord Jesus! In fact, in Denmark it has been socially acceptable to kill off older people who are not financial worth keeping around. I think I read that they made this behavior legal a year or so ago.